Mount Sinai (Arabic: طور سيناء‎ Ṭūr Sīnāʼ  or جبل موسى Jabal Mūsá ; Egyptian Arabic: Gabal Mūsa, lit. "Moses' Mountain" or "Mount Moses"; Hebrew: הר סיני‎ Har Sinai), also known as Mount Horeb, is a mountain in the Sinai Peninsula of Egypt that is a possible location of the biblical Mount Sinai. The latter is mentioned many times in the Book of Exodus in the Torah, the Bible, and the Quran. According to Jewish, Christian and Islamic tradition, the biblical Mount Sinai was the place where Moses received the Ten Commandments. 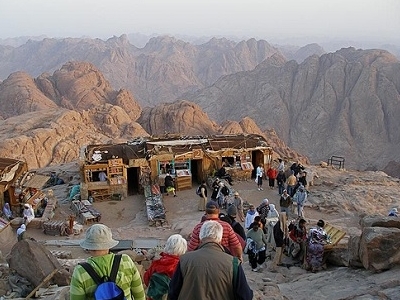 Mount Sinai is a 2,285-metre (7,497 ft) moderately high mountain near the city of Saint Catherine in the Sinai region. It is next to Mount Catherine (at 2,629 m or 8,625 ft, the highest peak in Egypt). It is surrounded on all sides by higher peaks of the mountain range. Mount Sinai's rocks were formed in the late stage of the Arabian-Nubian Shield's (ANS) evolution. Mount Sinai displays a ring complex that consists of alkaline granites intruded into diverse rock types, including volcanics. The granites range in composition from syenogranite to alkali feldspar granite. The volcanic rocks are alkaline to peralkaline and they are represented by subaerial flows and eruptions and subvolcanic porphyry. 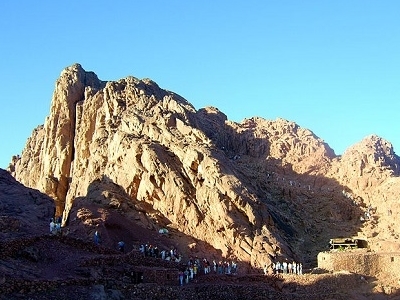 Generally, the nature of the exposed rocks in Mount Sinai indicates that they originated from different depths. The summit of the mountain has a mosque that is still used by Muslims. It also has a Greek Orthodox chapel, constructed in 1934 on the ruins of a 16th-century church, that is not open to the public. The chapel encloses the rock which is considered to be the source for the biblical Tablets of Stone. At the summit also is "Moses' cave", where Moses was said to have waited to receive the Ten Commandments. There is no Jewish place of worship or memorial associated with Mount Sinai. Here's the our members favorite photos of "Peaks or Summits in South Sinai". 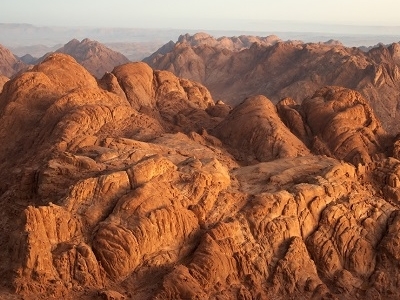 Upload your photo of Mount Sinai! Get in touch with 1 Touristlink members who want to visit Mount Sinai or with Willy Sihombing, Kelly Krause and 3 others who already have been here.